"Sometimes we’d think, How are we going to get through this?" says Santino’s dad, John. But strong faith, a supportive church community and access to Rady Children’s world-class medical care saw them through. Santino suffered from posterior urethral valve syndrome, a rare blockage of the uretha that interferes with proper bladder and kidney formation. "Santino’s was probably the worst case I’ve seen in my career," says Nicholas M. Holmes, M.D., chief of the Division of Urology and medical director of surgical services at Rady Children’s. With various complications preventing pre-birth interventions, Dr. Holmes and other specialists developed a post-delivery plan. He adds, "Everything we thought in utero proved to be true." 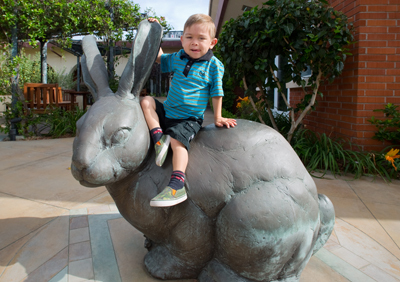 "We knew from the beginning that he would eventually need a kidney transplant," says Nadine Benador, M.D., medical director of dialysis and apheresis in Rady Children’s Nephrology Division and a clinical professor of pediatrics at UC San Diego. "We’d go every day to see him," says Yvette. "It was very emotionally and physically exhausting. But the NICU nurses were awesome. They made it so I could sleep at night because I knew they were taking good care of him." "Santino needed dialysis 10 hours a day," says John. "So every night, at bedtime, we would start the dialysis machine and connect all the tubes and then disconnect him in the morning." "It was a lot of equipment, so we mostly just stayed at home with Santino or at the Hospital for the next two years," says Yvette, who referred to Rady Children’s as the family’s second home. "The family has been phenomenal," says Elizabeth Ingulli, M.D., medical director of the Kidney Transplant Program at Rady Children’s and an associate professor at UC San Diego. "They did everything we asked them to do and more." By age 2 1/2, Santino was big enough to accommodate an adult kidney from his mother, who proved to be a slightly better match than dad, although both were eager to donate. "It’s hard to get a better match than the parents other than an identical twin," Dr. Ingulli adds. Yvette underwent transplant surgery at UC San Diego Medical Center in November 2011. Dr. Ingulli was in the operating room, and she and a medical courier immediately brought Yvette’s kidney to Rady Children’s, where Santino was awaiting surgery. "It was kind of a surreal moment," recalls John with a smile. "I’m at Rady Children’s, and I see this guy walk by with a box carrying my wife’s kidney." Both mom and Santino came through the surgery fine, and Santino gained energy and an appetite seemingly overnight. His health improved dramatically as well. "Everything gets better with a well-functioning transplant," says Dr. Ingulli, explaining that dialysis, while an excellent medical intervention, cannot function as well as a real kidney. "He’s done remarkably well," adds Dr. Holmes, who will remain Santino’s doctor until he’s an adult. "He’s thriving and catching up on developmental milestones," says Dr. Holmes, also a clinical professor of surgery at UC San Diego. "He’s a typical 4-year-old who likes his Legos and his superheroes. If you look at him now, you’d never know he was so ill."